After several days of unusually warm weather the garden is starting to explode. I could practically watch the daylilies grow higher and seeds begin to sprout. Unfortunately, we’ve had little rainfall in the past three weeks so soils are dry. I’ve spent the past three days positioning sprinklers, a job normally done in July not March. The water made every bed it touched come alive. It’s especially important in those beds where I want the seeds of biennials and self-seeded annuals to germinate. If I took a photo of these beds once an hour over the past two days I would have captured how effective the combination of rain and warm weather are for germination. Not that any of this is surprising. You don’t have to be a gardener to know that when the conditions are right, growth happens. Be it a nurturing environment for young children or a supportive on-the-job training for adults, everyone and everything thrives when given the right circumstances. For those of us who care about plants, we’re reminded to pay as much attention to rainfall in the spring as we do in the heat of the summer. Human beings in general should remember to do whatever they can to foster growth for themselves and others. What if we all went into each day resolved to create ideal environments for growth? This 'Magic Carpet' Spirea was bare twigs five days ago. After the recent warm temperatures and some water, it started breaking dormancy. 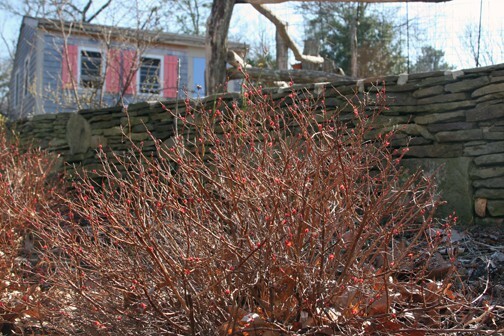 Red buds will lead to rosy-golden new growth. This is one of my favorite shrubs.